Recognized for being incredibly lightweight and durable, aluminum is one of the most popular materials used in the production of functional parts and prototypes. It also offers impeccable corrosion resistance, thermal and electrical conductivity, and also retains dimensional stability even in high temperatures and harsh environments. Since this particular metal has such a high melting point, the optimal way to cast aluminum parts is by utilizing the aluminum die casting process. This metal casting process that forces molten metal into a mold cavity under high pressure. Aluminum die casting requires the use of a mold cavity, which is created using two hardened tool steel dies that are machined into a specific shape. With aluminum die casting, a cold-chamber machine is utilized. Aluminum die casting reduces the amount of steps needed in production and prototyping, ultimately reducing manufacturing costs, while also providing parts with a high quality surface finish and exceptional dimensional consistency. This technique is especially advantageous in small-to-medium sized castings, and is widely used in industries such as automotive, aerospace, medical and more. However, in order to optimize the part quality in the aluminum die casting process, there are a few critical factors that you should keep in mind. 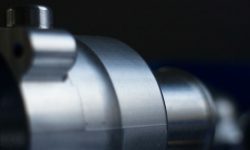 With these tips, you can utilize 3ERP’s professional-grade aluminum die casting services to its fullest potential, while also gaining a better understanding of this extremely popular manufacturing technique. 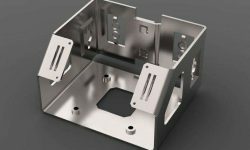 Before a designer or engineer can utilize aluminum die casting to its full potential, it’s important that they first understand the design limitations and common geometric features that can be accomplished with this manufacturing technique. Here are some factors that you should keep in mind when designing a part for aluminum die casting. Draft – In aluminum die casting, the draft is considered as the amount of slope given to the cores or other parts of the die cavity, which makes it easier to eject the casting from the die. If your die cast is parallel to the opening direction of the die, the draft is a necessary addition to your casting design. If you optimize and implement a proper draft, it will be easier to remove the aluminum die casting from the die, increasing precision and resulting in higher quality surfaces. Fillet – The fillet is a curved juncture between two surfaces that can be added to your aluminum die casting to eliminate sharp edges and corners. Parting line – The parting line is the point where two different sides of your aluminum die casting mold comes together. The parting line location represents the side of the die that is used as the cover and which is used as the ejector. Bosses – When adding bosses to aluminum die casting, these will act as mounting points for parts that will need to be mounted later on. In order to optimize the integrity and strength of bosses, they should have the same wall thickness throughout the casting. Ribs – Adding ribs to your aluminum die casting will grant more support to designs that need maximum strength while still maintaining the same wall thickness. Holes – If you need to add holes or windows into your aluminum die casting mold, you’ll need to consider the fact that these features will grip to the die steel during the solidification process. To overcome this, designers should integrate generous drafts into hole and window features. These are just the basics of what you should know when designing for aluminum die casting. If you want to optimize your mold further, you can contact 3ERP’s expert manufacturing team for assistance. If you decide that aluminum die casting is the right option for your production needs, you should understand the lifespan and maintenance that aluminum die casting molds require. The life of the die is hard to pinpoint because it’s heavily dependant on a number of factors. You’ll want to keep a variety of aspects in mind, including the design of the part, the tool steel used for the die, the mold configuration, heat treatment, the aluminum alloy that is being utilized, the desired part quality and more. Thankfully, when using 3ERP’s professional manufacturing service for aluminum die casting, our team will help ensure that each of these conditions is met accordingly. One of the best ways to extend the life of your aluminum die casting mold is by using heat treatment and die coatings. By applying these techniques, the heat checking will slow down immensely, ultimately extending the life of tooling. Of course, you’ll have to factor in that extra costs of these coatings, and decide whether it’s worth extending the lifespan of the aluminum die casting mold. When it comes to heat treatment, there are a number of critically important aspects to consider, such as the heat treat furnace used, the number of temperings applied to the die blocks, as well as the quench rate used during the heat treatment processing. At 3ERP, we offer personalized aluminum die casting and heat treatment services that are best-suited for each customer, helping you achieve the perfect balance between affordability and part quality. Aluminum Alloy A380 – One of the most commonly used alloys for aluminum die casting, offering exceptional fluidity, pressure tightness and resistance to hot cracking. K-Alloy – This specialized material is a cold-chamber die cast alloy that is engineered for use in parts that must withstand harsh environments. Aluminum Alloy 383 – When your design is more complex, this alloy acts as a great alternative to A380 as it provides better corrosion resistance and is lightweight. Aluminum Alloy B390 – Compared to other available materials, this alloy has high hardness and excellent wear resistance. Aluminum Alloy A413 – This easily castable alloy is an ideal option for parts that require excellent pressure tightness, such as hydraulic cylinders. Aluminum Alloy DCA1 – This alloy is a perfect choice when you need to manufacture parts with high thermal and electrical conductivity, such as heatsinks. Last but certainly not least, if you’re interested in implementing aluminum die casting into your product development process, don’t be afraid to consult with the specialists working at a manufacturing and rapid prototyping service. For instance, at 3ERP, we have experts with knowledge on the best practices regarding aluminum die casting, helping to optimize your part design and quality once it’s finally produced. Whether you’re struggling in the design phase or just don’t know which aluminum alloy you should utilize, our expert team is readily available to guide you through the complexities of this manufacturing process. To learn more about 3ERP’s aluminum die casting services, contact us here.